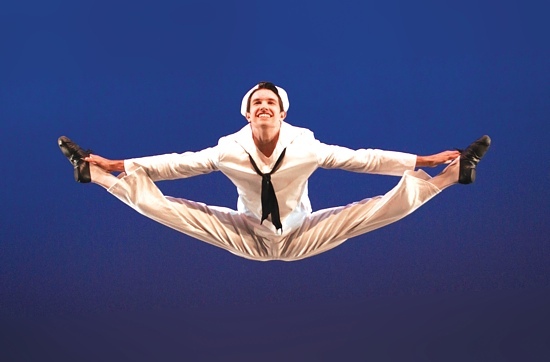 Philip Neal, Richmond Ballet’s most treasured alum, is back again. Still glowing from the success from his last original venture, Phoenix Rising, we got another chance to chat about his role as the répétiteur of Jerome Robbins’s Fancy Free and the rest of the RB’s ambitious 30th anniversary program this weekend. What’s the process for a répétiteur like. Does it differ from person to person? I think for some, the process might be simple, like note-taking. But a répétiteur has to know all aspects of a ballet. It’s not enough to know what the steps are, you have to be familiar with the score and everything else. So you’re really helping the entire operation, not just the company. Right! And I can, because I’m very familiar with the work. If a répétiteur hasn’t performed the work, they’ve still been around the work for many years. You often have the answers just from having seen it so many times. I was called to Fancy Free rehearsal my first few months in New York City Ballet, so I’ve looked at this ballet for 23 years. I learned it from Jerome Robbins directly, so…[Philip takes a dreamy pause and I can’t help but picture his experience with the master as something like Michelangelo’s The Creation of Adam . ]…sometimes I’ll be sitting there with a dancer, and I’ll remember, “Oh yeah! Jerry Robbins said this to me!” And they’ll understand, because he talked to dancers like they were actors. He’d say, “Why are you doing this? What’s your motivation?” That’s why you heard me in the rehearsal saying things like, “You’re thinking this or that.” Because they need to have character development in order for their actions to mean something. And that doesn’t always happen in a ballet! Balanchine was famous for saying, “Don’t think, just do”—the emotions are built into the choreography, you see. This is very different. It’s more precise. You’ll see a dancer look one way and another one reacts—there’s counts for all of it. It’s very carefully choreographed. Like a punchline. Do you find that the dancers are any less confident about the acting parts? Is it a different process directing them to act versus dance? Well…I have such a head start because I do so much work here, and I know how they’re going to receive criticism. I think if I were somewhere else, I might be a little more sheepish about being so open with my corrections. I always want to empower the dancer—I don’t want to beat them up, but we don’t have a lot of time before the show. Usually I’d have to come in and audition to do casting, but I knew exactly what I was going to do before I even got to Richmond. So that saves us time. How do you keep notes for yourself? [Laughs] Poorly. [Reaches into bag and pulls out a folder full of meticulously kept, very tidy lines of handwritten print.] I actually write the whole ballet down. In Philip scrawl. That no one else can understand. This is the whole ballet. It is my responsibility when I leave that the ballet master has all the information they need. And every répétiteur has their own way of notating? Well, Jerome Robbins was known for not using ballet vocabulary. He would say, “You kick to the front, you swing to the right!” That’s how he liked to work! Whereas with Balanchine, répétiteurs would use all the terms. How confidential are those notes? I wouldn’t have a problem sharing with somebody else, but they just wouldn’t understand my personal system, especially in this chicken scratch that I did [gestures to impeccable, type-like handwriting again]. I know that it’s a real honor for Richmond Ballet to be approved by the Robbins Rights Trust to perform this ballet, but how does something like that come about? How does a company make the cut? Philip Neal rehearses Maggie Small and Matthew Frain. Photo by Sarah Ferguson. The artistic director, Stoner, has to want to do it. Then she contacts the Robbins trust in New York, and they decide if we qualify. Then we got the “yes” or the “no” (and we got the “yes!”) and work out the budgets and royalty fees. I think I was a natural fit because the Robbins trust knows how much work I do for Richmond. Then it was up to me to start doing all my research from memory, from video, from notes…very often I’d text my friends in New York who know the ballet and ask, “Do you remember what you did on that count?” or even “What do the shoes look like?” I’m lucky to have the right people to ask. But this was a really big deal because they decided to build their own sets and costumes and not rent. This way they can repeat it and even rent it out to other companies. Fancy Free was so popular that it became the basis for an adorable Gene Kelly film, On the Town. Why is this piece in particular such a big deal? Robbins, while he has a vast repertoire, has about four or five ballets that everybody wants to do, and Fancy Free is at the top of the list. And interestingly, it was his first ballet. And his first commission with Leonard Bernstein. And if you look at it, you can see precursors to West Side Story! Robbins was more musical theater and less ballet. Everything at the time was more ballet blanc, like Giselle and Swan Lake, and all of a sudden Fancy Free premiered, and people just went nuts. It had 22 curtain calls on opening night. And here were these guys in their early twenties—Robbins and Bernstein—with a ballet that went on broadway within a year. It’s just…it’s so immediately likable. You don’t have to know anything about dance, you just GET it. The plot is so clear, and it always works. That’s not to say it can’t go horribly wrong if it’s not coached and presented properly. What happens when it does go horribly wrong? Does a répétiteur take responsibility? Does someone from the trust come and knock on your door late at night? Fortunately, I have yet to have an experience where I wasn’t proud of what I had done. It could be that the répétiteur isn’t happy with it and tells the trust, or the report comes from another person. I think we don’t take something on if we feel like we’re not qualified. And Stoner would never ask for something if she didn’t know her dancers could do it right, and that’s to her credit. And what kinds of things did they look for at Richmond Ballet before they agreed to give it to her? It’s like how they say you are what you eat—you are what you dance. Richmond has increased the number of dancers and the number and quality of ballets. They’ve also had really strong male dancers that can not only partner but can dance. Since you were just here choreographing one of your own dances, what’s it like doing something like that versus something like this. Less pressure? More pressure? Less emotional? More emotional? Honestly, it’s more pressure to choreograph, because…at least this is finite! You know what Fancy Free is. You don’t ave to wake up this morning and wonder how you’re going to fill the music with this step or that step, how you’re going to collaborate with the costume and lighting designers…It’s terrifying. It’s really wonderfully terrifying. This is less scary, just because of the familiarity.You really have to saturate yourself with it, so that you’re waking up in the middle of the night and all you hear is the music and you’re counting the steps in your head. The part that I love is the finesse. The detail. All the stuff of the three or four days before the show. For me, it’s the high that I would get from being a performer, this is my new high. Vicariously through them. What should we look out for within this program? What I love about Fancy Free is that you can know very little and still have a good time. Robbins tells the story so well–the dance moves it forward. The action’s telling the whole plot. Serenade is just the most gorgeous piece ever, and this one is funny, and Rite of Spring is riveting. This is the kind of program that is A+ world-class ballet company program. This is what you’d see at New York City Ballet or Royal Ballet of London. Is this the most challenging they’ve done so far? For a repertoire program, yes. At least, this is the most ambitious they’ve done so far. And there’s no better time to do it than on the 30th anniversary. It’s a perfect mix of qualities. There’s nothing repetitive about it for the audience, and it gives the dancers great opportunities and lets them progress. It’s even a technical progression, one’s en pointe, one’s in character shoes, and one’s in flats. It’s really something to see. Ballet Master Malcolm Burn watches as Richmond Ballet dancers rehearse Fancy Free. Photo by Sarah Ferguson. Richmond Ballet’s 30th Anniversary Celebration runs from Friday, November 1st to Sunday, November 3rd. Buy tickets online and see Fancy Free, Balanchine’s Serenade, and Aiello/Stravinsky’s Rite of Spring.